One of the byproducts of cheap flights is having to deal with awful departures, layovers and arrival times. But that’s what travel hacking is all about: relinquishing luxury to make travel cost less and last longer. Coming from faraway places like Australia, you can easily end up with 40+ hour flight itineraries. And chances are, somewhere in that 40 hours, you’ll have to spend the night in an airport. But all is not lost; many airports let you stay for free, and when they lock the front doors, you can really have a ball. So, no need to fret, we will show you how to sleep in an airport and actually enjoy it. It may not seem so, but a 40-hour itinerary without a night in an airport is pure hell. It took us 43 hours to get from Sydney to Kilimanjaro International Airport in 2008. We spent both nights in the air, without a chance to lie flat in peace and quiet, which left a lot to be desired. It’s no secret that the cheapest flights are usually those stitched together from multiple airlines with multiple layovers. As you scroll down the list of potential cheap flights you begin a debate with yourself: “should I pay $50 more for 5 fewer hours in the air?” But keep in mind, a 40 flight spent mostly in the air is much more painful than a 45-hour flight that spends a night or two in an airport. Sleeping in airports will seem a little strange. You’ll feel as if you’re contravening some law or rule as passengers leave and the cleaners roll in. It feels sneaky. It feels clandestine. It feels 007! Maybe it’s just me, but I need to be super-duper tired to get a good sleep sitting up. I could just travel first class, but that’s not what travel hacking is about. Just remember, no pain, no gain. But less pain is good too. In an airport, you have about a gazillion acres of floor space to set up camp for the night. I prefer to find a spot near a power outlet, so I can keep the MacBook charged while watching a movie or getting work done. Also, try to keep clear of high-traffic areas so the early birds don’t wake you in the morning. In many airports, when they lock the doors, you generally have the place to yourself. Sometimes you’ll see security guards, but most of the time it’s just pure emptiness. So rather than sleeping in airports, some people like to explore them. If you’re the exploring type, then get moving. Most airports are huge and they make it easy to take a stroll, bump into the cleaning staff, look out the windows, etc. Try not to get up to too much mischief though, because countries are especially sensitive around airports these days, and airport officials generally won’t hesitate to detain you. If you’re not the exploring type, never fear. Most airports have decent wireless Internet connectivity. So you can surf the web, get some work done, write a few blog posts, and get in touch with people on the other side of the globe. Where in the world would you find the greatest concentration of travel hackers and global nomads? In airports at night of course. Who else would choose the hard floors, locked doors, and blinding fluorescent lights? As an intrepid traveler, you’re probably more likely to build lasting friendships here than anywhere else. In 2004, Lauren and I spent the night at Geneva Airport. As soon as security locked the doors and dimmed the lights (don’t expect this kind gesture anywhere else), the travel hackers all came out of hiding. Next thing you know, there was a crowd watching a movie in one corner, a group playing in-car video games in another corner, and an American football being thrown the length of the gate at the other end. We had a blast that night. Clearly, our best experience was a night in Geneva Airport. More recently though, we stayed the night in JFK New York. For a place that apparently never sleeps, well, it was dead asleep. Plus the cleaners weren’t very friendly and they were banging vacuum cleaners next to our heads for what seemed an eternity. 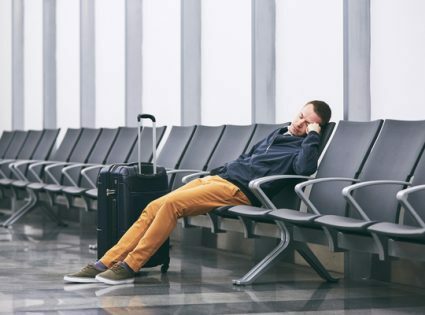 But don’t take my word for it, check out this other great resource where people from all over the world share their experiences sleeping in airports.